In 2008, we changed the electric bike market forever with the world’s first true e-bike. We have been designing e-bikes that ride as beautifully as they look ever since. Our passion to achieve the perfect balance of design and performance has resulted in the creation of the 9 exceptional e-bikes we have in our collection today. Each bike has its own distinct identity. Inspired by the world’s great innovators, today’s A2B range is the result of the engineering innovation and design brilliance of our Berlin design centre. We believe that it’s the minute details that make our e-bikes so special; the attention to detail, drive for perfection, thought and hard work that goes into each and every model. 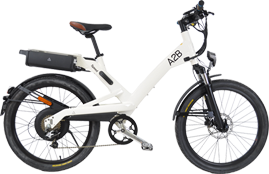 Award-winning design, superb performance, German precision - view our collection to find your perfect A2B e-bike. The model’s revolutionary German drive system with over 2500 sensor points in the motor alone make for extremely smooth acceleration to ensure that it is always a pleasure to ride. The hydro formed frame gives the bike a distinctive fashion bias, along with a lower centre of gravity for easy use in urban situations. The design of the Ørsted deliberately has a more ‘European bike’ feel. Beneath the distinctive design , state-of-the-art German technology is abound. Rigorously tested, the innovative drive line delivers one of the smoothest rides available. The Entz has an innovative motor that has bands and not metal gears, coupled with a carbon belt makes it truly silent to ride. Combined with an automatic gear hub that provides seamless gear changing. It will revolutionize the way you ride bikes forever. Designed to be highly portable, the small lightweight bike folds down to be rolled in and out of public transport with ease, the ultimate commuter. Despite its small size the bike delivers the same big punch and power just like all our full sized bikes thereby making it a very exciting ride too. "Best value for money s-pedelec" in class as tested in Bike Bild issue 2 2017 says it all. Not for the faint hearted, this bike delivers tons of torque and top speed of 45 km/h. It gets you where you are going fast but without breaking a sweat. The high power delivery from the 500 watt motor is married to a strong rigid frame and up spec hydraulic brakes for a complete package making this bike very exciting to ride. Maybe your ride takes you out to dirt roads in the country side and that is where the Kroemer comes into its own. Capable city riding bike that can take on the dirt roads outside of town makes this a very versatile bike. The 24 speed gearing should help in any situation you find yourself in. Like the city bikes it has a handle bar remote to change through the 5 levels of assitance while on the move. The perfect entry level bike for those new to e-bikes. This bike has a low step through frame to make it easy to mount and control at slow speeds. This bike has a good motor system and large battery capacity so you can eat up all those miles like many of the more expensive bikes. 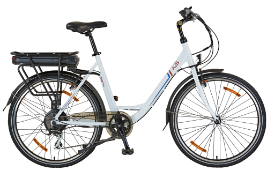 This bike has all the features you would want including mudguards integrated lights and a luggage rack so there is nothing to spend or do on this bike but charge the battery and get out there riding. For those that just want a good old bike. Something simple stripped down with function as the main form. Something used in the urban jungle. The Blake is simply that bike. A light weight bike with a single gear configuration. We need not say much more but this bike has the same drive and top speed as all our other bikes but with everything stripped back to a bike. The Boost is the 4th evolution in the Kuo range of folding bikes. It builds on all the great things of the Kuo+ and then turns the volume up on everything. The motor is boosted to 350 watts, the battery increased by 35% capacity, the brakes upgraded to disc front suspension to name a few. All the running gear from the lights, mudguards, tyres have been further upgraded too. Everything you loved in the Kuo+ has been boosted. 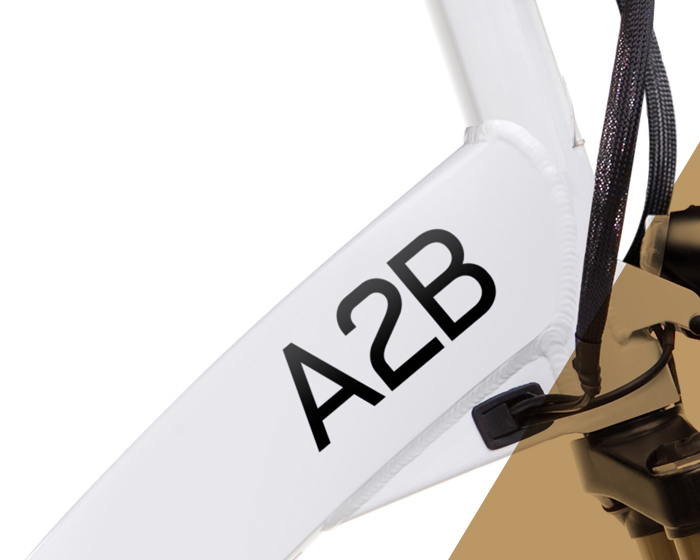 Designed to perfectly complement your lifestyle, your A2B bike comes with a choice of accessories to buy. From a range of quick release baskets and saddle bags, to second and replacement batteries, our accessories allow you to shop, commute and travel in style and comfort, while extending the potential range of your journeys (depending on your model).